Tne Fusion is a Norwegian based company. Since 2005 they have been developing and refining a new type of horse boot using a totally new concept. They have developed a highly flexible yet strong hoof boot that moulds around the hoof capsule to mimic the hoof shape perfectly! Fusion offer a flexible, light and durable "Jogging shoe" that protects the horse’s hooves from shock, wear and unnatural pressure yet allows the horse normal biomechanics. The Equine Fusion company has a multi-skilled and international team dedicated to the performance of the shoe and the welfare of the horse and rider. The Equine Fusion Jogging Shoe is based around supporting and enhancing the natural hoof anatomy and function. Their boots are already widely used in many disciplines in Norway and Europe. The Active Jogging Shoe consist of the cone locking mechanism and a heel design which enables the unrestricted natural movement of the heels, and padding in the front of the shoe for comfort. Distributed in pairs allows for a smooth inner side of the shoe with a smart lock on the outside. The "All Terrain" Jogging Shoe is soft and flexible, just like all the other Jogging Shoes, but has a thicker sole which makes it more wear resistant and provides excellent grip on all surfaces. It is robust and works well for horses involved in equine sporting activities. It offers a new sole tread and has a natural breakover that that allows the horse to have an almost identical breakover to the barefoot hoof. - No straps or external locks. - Reflex band for better visibility. Available in Black - can be used with Fusion "dampening" pads to provide added comfort. The "All Terrain" Ultra Jogging Shoe is soft and flexible, just like all the other Jogging Shoes, but has a thicker sole which makes it more wear resistant and provides excellent grip on all surfaces. New sole design - Thicker sole gives excellent protection for the hoof - New pattern which gives you excellent grip on all surfaces - Optimal roll over for the hoof Superb durability - High strength upper - Wear resistant rubber sole designed for tough challenges Stay on - Safe and secure - No straps or external locks. - Reflex band for better visibility. Easy to use - On and off within seconds! 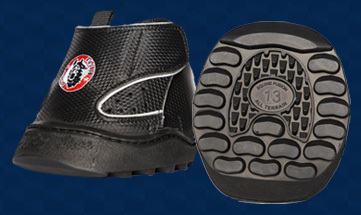 - New and intelligent, patented Velcro locking system The most comfortable hoof boot on the market - can be used with Fusion "dampening" pads to provide added comfort. Can't find boots for very small horses? 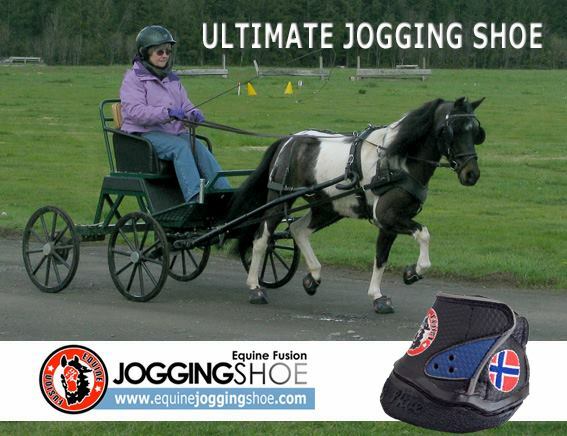 The Equine Fusion Jogging shoe is the one for you. 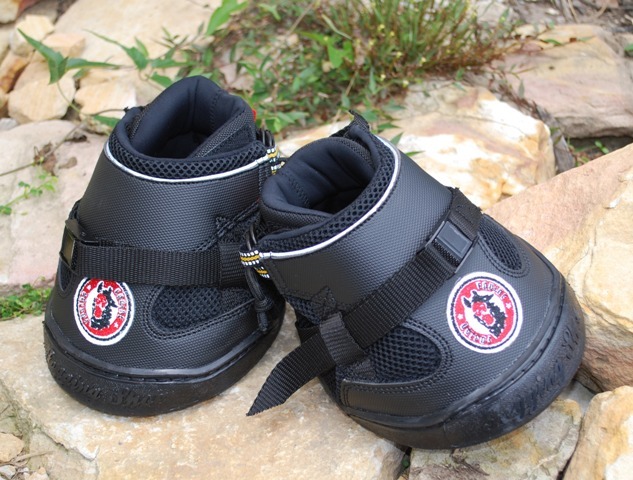 The Equine Fusions Joggers are the first boots/ jogging shoes available in sizes small enough to fit miniature horses! 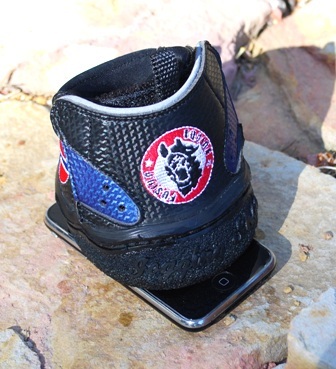 Boot pictured is so small it fits on your iPhone. Works with the hoof : The horse's hoof is a dynamic structure that adapts to the ground surface to create perfect balance, stability and grip. 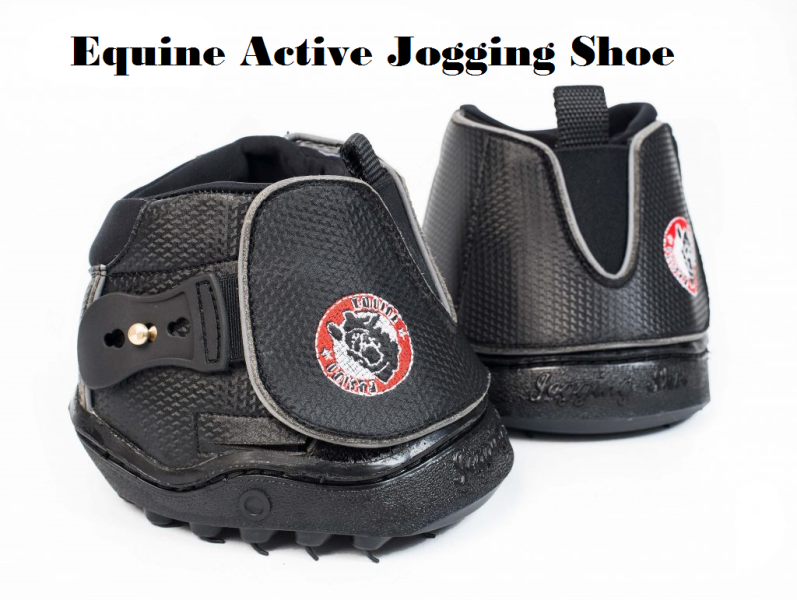 The Jogging shoes are designed to work with the hoof to support this natural function through the flexible sole and unique fastening systems. The forces that impact the hoof are distributed through the sole of the shoe, not the sidewalls. 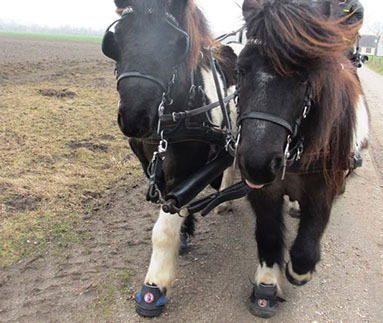 Does not require a 'perfect' fit: The Jogging shoes allow for variations in hoof size and shape and will adapt to the hoof throughout the trim cycle. Easy to clean: The Ultra and Performance models can be washed in the washing machine and tumbled dry on a low setting. No spare parts required: Best product for both the horse and owner - Provides the horse with the ultimate in comfort and the owner with peace of mind. The Ultimate Jogging Shoe is soft and flexible, and features a new heel design which enables the unrestricted natural movement of the heels. New heel design that eliminates rubbing. On and off within seconds! No need for spare parts.